Safety Nurse sat down with Margo, a fantastic oncology nurse, who talked about the night she gave a patient too much insulin, and he coded. He lived, and Margo is still at the same job. The hospital where she worked supported her and included her in a Root Cause Analysis of the event. Margo is now a well-respected nurse leader at her place of work. In the interview, she opened up about how the error went down, and we talked about the inevitability of error. Did you like this content? Donate TODAY to support Rose Katiana on her journey through nursing school, and let me know what other content you want covered. Listen to the podcast on iTUNES and review it – it really helps get my message out there! I sat down with therapist and friend Kelly Wedell EdD, LPCS to talk about Eye Movement Desensitization and Reprocessing (EMDR). EMDR has been used to successfully treat PTSD, and is being increasingly used to treat childhood trauma. I have been in therapy for over 20 years for childhood trauma, but haven’t tried EMDR. I am looking for therapies that will help me deal with triggers and reactive emotional responses that cause problems in my work and personal life. EMDR is an incredible, evidence based resource you can utilize yourself and recommend to others who have experienced trauma in their lives. There’s a podcast of the interview, a video of a mini EMDR session involving Star Wars, and an article/blog post on Allnurses.com. I’m a freelance writer for Allnurses.com now, so check out my blog posts and the interesting discussions that occur on the Allnurses.com website. Listen to the podcast on iTUNES and review it – it really helps! An interview about Emotional Freedom Technique (EFT) also known as tapping, with Rachel Durchslag. Rachel is one of the few practitioners in Asheville certified in EFT. Rachel talks about her business, Emerge Asheville, a healing practice dedicated to making energy healing work accessible to all. We discuss how EFT works, how to do it and Rachel even leads me through a mini session. She also shares how she came to be in Asheville, and talks about some of her passions which include supporting practitioners with healing, Mama Maisha (dedicated to reducing mother/infant mortality in Tanzania) and backpacking in the mountains. I like this woman. You can read the BLOG POST on Allnurses.com HERE – lots of good discussion! What if I’m the bully? Bullying’s in the news a lot these days, but for every person bullied, there has to be a bully…and what if I am that person? I’m going to tell you a story of incivility and bring up some ideas and questions about how we deal with the bully if she is me. Incivility is part of a larger communication issue. Communication is one of the most often cited root causes for sentinel events. Solving this problem will lead to safer patient care. Click HERE for a link to my AllNurses Article including a great discussion! Three things you need to do to keep your nursing license safe: An interview with Lorie Brown, RN, MN, JD. This is episode 10, an interview with Lorie Brown, an attorney and nurse who helps nurses with license protection and empowerment. Listen on iTunes – like, subscribe, rate the show – it really helps! Lorie graduated as a nurse from IU in 1982 and has worked in gynecology, urology, neurosurgery, ortho, general surgery, home health and med-surg nursing. She has also been a camp nurse. LB: when the nursing shortage [happened], I floated and did PRN work and even did organ transplant, I did pediatric ventilator, subacute care, everything – you name it I did it. SFN: you were the nurse where they run in with the cooler? SFN: you helped them deal with accepting the organs and with immune suppression. And how about dealing with psychology? SFN: You graduated from IU law school in 1990 with J.D. (doctor of jurisprudence) you also have a double master’s degree as a clinical nurse specialist and nursing administration from UCLA. Which do like better, Indiana or California? SFN: yep, I guessed it, California. But you are here to be near family. SFN: one of the things you have said is that you want to give nurses a forum to exchange ideas and change the practice of nursing for the better. LB: Nurses have no soft place to land, nobody understands nurses like other nurses, yet we don’t have the support we need. I would love to have a community where nurses can say, “well at our hospital we do this, have you thought about that?” and we can share best practices with each other. Sometimes nursing units aren’t the healthiest, and we aren’t always supportive of each other. If we band together from all over, we can solve the problems of nursing. SFN: I agree, I was just teaching a seminar to 6 nurses today, and I was talking about medication errors and said, “and we’ve all made errors” and they all froze. It’s ok to talk about some parts of nursing, but other topics are off limits – they are still very taboo to talk about. I am really interested in what motivated you to become a lawyer? LB: I wish I had a better story, but I don’t. I had a really good divorce attorney and realized I could do it. It has been the best thing. SFN: Did the attorney encourage you? Or was it the way they handled the case? LB: I knew I wanted to continue my education, but I didn’t want to teach or do research (boo! ), but I was a unit manager of our county hospital and my co-manager said, why don’t you go to law school? And I thought that made sense – that was in April. I took the LSAT in May, got the results in June, got accepted and applied in July and started in August! SFN: that’s incredible, that is such a great story, it inspires me. I keep hoping to find a nurse who will get a computer science degree and design a better documentation platform – one that actually works. LB: Now they have tracking systems that are ipads outside the rooms and you can just tap them and enter the important information and move on. SFN: At the National Patient Safety Foundation conference I went to, they have sensors in badges now that sense when you are near a hand sanitizer and keep track of how often and how long you use it, and how often and how long you are at the sink [I did NOT say this as well in the actual interview, FYI]. Knowing nurses, they probably find a work-around for that, because that’s what we do. SFN: if you can, tell me a story about someone you have helped, and I realize that you are a lawyer and a nurse so there are two levels of privacy there. LB: I have worked with over 400 nurses so it is hard to pick just one. LB: This came before the nursing board, so this is public and I can share it. A client was accused of patient abuse, of sending a patient to the morgue with a BM (bowel movement). I was interviewing the nurse who had turned her in and asked her, “well which way did you turn the patient”? and she said “I don’t remember”. My client said that the patient had been turned to face her, would you disagree with that? She said no, and then I said, so you were the first person to see if he had a BM or not, and you didn’t clean it up and you didn’t say anything. So you are just as guilty as my client of patient abuse. She said, “I am not answering that, I’m not on trial here”, but her attorney advised her she did have to answer, and she agreed that this was the case. I am not in favor of throwing people under the bus, but they wanted to suspend this nurse and I was able to save her license. LB: and the thing is that anyone can say anything about you and it is really difficult. Because of my nursing knowledge, I knew how they clean up a patient and turn them from side to side. Because I am a nurse and have that knowledge, I was able to defend her. SFN: I agree, I feel safer just knowing you exist! Are there a lot of other people out there like you? LB: Yes we have an organization – it’s The American Association of Nurse Attornies (TAANA.org). We have about 300 members and practice in all different areas. Some of us practice in health care law, some of us teach because they need someone with a terminal degree to teach (and JD is a terminal degree). Other people do risk management others do medical malpractice, but there are a number of us who do license defense. SFN: Could a nurse who was having trouble, and who got reported to the board regardless of the state, contact you for help? SFN: It is a great website, I admire it and appreciate it. What is the most important advice you can give nurses who are reported to the board? LB: Of course this is self-serving, but don’t do it alone. When you get a complaint or investigation, they specifically say you have the right to obtain an attorney at your own cost. The state has an attorney, the board has an attorney, why do it by yourself. LB: but again, it’s your license and your livelihood and it depends on how much you value it. SFN: You make a good point. You said you get about how many calls a day from nurses? LB: I have no idea, I am just grateful to be able to help and do what I can. I just think that…I was just talking to a client today – why are nurses treated so differently from other professions? I do all health professions, not just nurses. When you go to the board for pharmacy and medical boards, for the same things, and they say “just don’t do that again”. Do nurses get fired often? LB: They do, all the time. And unfortunately we are employment at will they can get fired for any reason, they don’t have to have a reason. If you see the writing on the wall, resign first. If you don’t you are going to have to put that you were terminated on every employment application [don’t I know it]. We do this thing called graceful exit, which helps nurses to resign. We ask that they don’t contest unemployment, and that they provide a neutral reference. Things that we think of that can protect the nurse. We help them get out of bad situations. If they suspend you [you will likely get terminated]. I have only had one case [in which the nurses who was suspended did not get fired], the nurse was accused of diversion, but they found the person who was actually diverting the medications, but that is the only case. If you are suspended, chances are in my experience you will get terminated, so make sure you resign yourself, make a graceful exit. Make sure they accept your resignation – they don’t have to accept your resignation. Is there anything you can do in that employment at will environment. LB: not really – I always say you can get another job, but you can’t get another license. If you see you are short staffed, go get another job! This is a great environment now, they need nurses – there is a better place out there for you. SFN: Switching gears a little bit, as you know my focus is safety – I’m mad about safety, I’m obsessed. How do you define safety? You can answer as an attorney, a nurse or a human being. SFN: Is there anything you do in your own life to promote your own safety and the safety of those around you? LB: I am very pro-active. I give my nurses (clients) homework. I tell them to make a laundry list of all the good things they have done. The board isn’t expecting them to do this. I want them to walk in with a list of all the good things they have done. When they go before the board they always pick out all the bad things they have done. All the good is forgotten. SFN: I have a question about that. When I went before the board I got a phone interview, which I was grateful for. The board had all my records, and they had a record of all the patient complaints I had received – there were like three – and I couldn’t recall most of them. What is the difference between getting written up and…it surprised me there were things in my file I didn’t know about. LB: I hear that all the time. When you have a complaint, we always get the investigation file, and we go through it with our clients and they say things like “I didn’t know about this” and “this isn’t what I was told”. I don’t know what you can do with it. If you are presented with a write-up, put your side of the story on it, don’t just sign it. Make sure you have your record in the file. SFN: I was just surprised because I thought that to put something in your file, you had to sign it. But apparently any time someone calls they pull your file and jot it down. LB: They write down everything. SFN: It seems like they write down all the bad things, but none of the good things, they don’t write down all the times the patient said something nice about you. SFN: we have to do that! That’s what it sounds like you are saying – we need to keep track of all the good stuff. LB: Speaking of which, unfortunately before the board, [legal definition alert!!!] Here-say is an out of court statement offered to prove the truth of the matter asserted . We hear on TV “that’s here-say – you can’t use that” but unfortunately, there is an exception called the business records exception, even though it’s all here-say, they can be used against you. SFN: That is fascinating – even though it is your word against theirs, they can say whatever they like, but it’s a business record. LB: But a business record is NOT considered here-say, so they consider that reliable and authentic evidence. SFN: While you are an employee, can you request to look at your file? LB: no, it’s not yours, it’s the employers. LB: It’s true, nurses are getting fed up. I always joke that we are the McDonald’s of medicine – whoever can do it quicker and cheaper and get ‘em out faster [makes the most money] and it’s not like the way it used to be where care was designed for communities to take care of our own, and for religious organizations to take care of our own. Who would have ever thought they would make money off of sick people? What is the most unsafe experience you have ever had? LB: I can’t say that it was unsafe, but I am very big about nurses being able to speak their mind, when I was a nurse manager, they hooked up a colostomy backwards, and so the distal end was hooked up to the ostomy, and the proximal end was sewn shut, and we were told not to say anything to the patient and that really bothered me that we were asked to be quiet when the patient has a right to know about their own medical care. SFN: I have studied a lot of safety culture and it always surprises me that we don’t require disclosure, that we are afraid to disclose and that we don’t have better laws. I always tell patients to find out if their hospital has a disclosure policy, because you have the right to know. LB: Actually some hospitals now have a full disclosure policy, where they will bring in the patient and family and tell them everything with trained people and settle their case quickly, which may or may not be a good idea because they might be able to get more money if attorneys are involved. SFN: A lot of the patient harm case studies I have read say that the most important thing to the patient and family is to get an apology, and the need for a big pile of money diminishes. Sometimes it makes a patient feel so much better just to hear the doctor say “I am sorry”. I don’t think hospitals realize the value of that. LB: Unfortunately, our society we can’t make things better – the only thing we can do is pay money. I have had lots of clients say “I want to sue the doctor, but not the nurse” because nurses have that special relationship with the hospital. SFN: I think I already asked this – what is the most important thing a nurse can do to protect her license, besides get to know you really well? LB: There are actually several things. Keep your address current with the board. I am surprised at how many nurses forget to tell the board they have moved. The first thing that will happen in an investigation is that you will get a letter from the board. And you will have an opportunity to respond to the letter and meet with an investigator. If they don’t have your current address, they can take action without you, saying you haven’t responded and do whatever they want. Be honest on license renewal application. If you don’t understand the question, ask. Where nurses get into trouble in my state in particular is they ask if you have been arrested or pled guilty or no-contest to a criminal matter. If you have had a DUI and you are on diversion for a year and it goes away, you have still been arrested and have to answer yes even if it is dismissed. Ask someone who practices before the nursing board if you r interpretation is correct. Don’t call the board of nursing. The clerks who answer the phone don’t necessarily understand the process or know the answer and cannot give legal advice. Answer honestly on your license application. Many nurses in our state get in trouble for fraud and material misrepresentation in obtaining a license, they don’t put a criminal matter, they don’t put they were terminated or written up. You can always deal with presenting it in a light most favorable to you, but don’t try to cover it up. SFN: What is next for you? What is in the cooker? Go to my website www.empowerednurses.org and sign up for my newsletter “Thrive in your nursing practice”, which we will be changing to “Empowered nurses challenge” shortly. We currently send out a weekly newsletter that gives tips on protecting your license or being empowered as a nurse. Last week I wrote about complaining. SFN: I saw that one! LB: You are at work the majority of your life, why work in an environment that is complaining and how do you change that? And this week – I am working on it right now, once a nursing board matter is done, it becomes part of the public record and it stays on your record forever. I would love to have those type of things expunged. If it was an isolated event years ago, why does it need to stay on your permanent record. SFN: here here, tell me how I can help with that. I was lucky I didn’t have disciplinary action, but was terrified I might and I went and looked at the list of folks and I saw things dating back to the 90’s, it’s like the wall of shame – it is so sad. LB: It is – I always say don’t let this one thing define you. That is not who you are an shouldn’t negate all that you have done as a nurse. SFN: I 100% agree, and it is so nice to hear someone else say that. LB: just sign up for the newsletter and whatever the free thing is on empowerednurses.org, you will get information about it. What do you do for fun? The theme of the ANA this year is self-care, so I am trying to ask everyone about that. I was actually just in Bloomington [Indiana] yesterday, my mom lives there and you said you have a child who goes to Indiana University? SFN: And one still to go? SFN: I bet! I am a member of the American Association for Professionals in Patient Safety and they put out the top 20 patient safety articles every month in a e-newsletter, I love that because I don’t have to worry I am missing the next big thing in patient safety. As a patient safety specialist, I don’t want to miss something big – like suddenly we figure out how to prevent error, and I missed it. Is there anything I didn’t ask you that you would like to talk about? SFN: I always suggest that nurses join the American Nurses Association, they have great political action PAC, do you have any other ways? LB: Be involved, I remember when I was in nursing I wasn’t involved, I wasn’t and I think I would have enjoyed it. I ask my clients what nursing associations they are involved in and it is surprising with the Indiana State Nurses Association, membership is less than 1% of the licensed nurses in the state. I know sometimes nurses are upset that the ANA endorses a particular candidate, but you know that’s part of it, that’s how it works, and they ask the members which candidate should they endorse and it may not be your candidate, but it’s the majority. The ANA is fighting for safe staffing and fighting for nurses and are the only politically active organization for all nurses, not just specialized nurses. I would also like to see nurse practitioners get full practice authority in every state. It’s about time, and to call them midlevel providers is just an insult. Anything that demeans our profession, we need to put a stop to that. SFN: I am right up there with you, make room! Thank you so much I really appreciate it. Something I didn’t mention in the podcast – Lorie sells these really cool intention cards. It’s this beautiful deck of cards (see pic) that can help you get clarity on an issue. I have a few friends who have similar decks and I have been wanting one for a while. Before I left her office, after the interview, Lorie gave me some tips on developing my pitch/business plan, which I am so grateful for! The first thing she did was hand me a deck of these cards and ask me to pick one. It was “VALUE YOURSELF” pretty sweet –made me tear up and felt really good. I bought a deck, and you can too – go to her website www.empowerednurses.org for more details. She also had me do a cool exercise: draw a square and divide it into 4 parts. Fill the upper left part with things you are good at and love to do. The upper right box gets filled with things you are good at but don’t like doing. The bottom left is things you don’t like to do and aren’t good at, and the bottom right is things you would like to learn how to do – you love them but aren’t good at them (yet). It’s a pretty enlightening exercise. I really enjoyed it! Lorie is an incredible person, and I encourage you to contact her for legal and empowerment support. I am really looking forward to the free videos. A few more notes – I did this interview Tuesday, August 13 at Lorie’s office in the Broad Ripple neighborhood of Indianapolis Indiana – but I am having a hard time remembering what day it is! I got trained over the weekend to teach a human sexuality workshop called Our Whole Lives. The curriculum was created by the Unitarian Universalist Church as well at the United Church of Christ and it is amazing. I then flew to Indianapolis and got to hang out with my mom and my sister – we went for an incredible hike, and had a few beers. I then taught a seminar for Vyne education in Indi on Root Cause Analysis to 5 nurses and an OT (sounds like the beginning of a bad joke…no we did not walk into a bar). Then I got to have two Indiana traditions with my favorite Auntie – I had a fried pork tenderloin sandwich (don’t ask, it gives you indigestion 100% of the time) and today I ate a Royal Feast at Pizza King where I had one of my very first jobs. It tasted the same, and was divine, and also gave me indigestion. I will teach the seminar again tomorrow and fly home to kiss and hug my family a ridiculous amount. I hope to hear from you, please comment on the show notes, on the podcast, and reach out to me with suggestions for topics. Welcome back to Safety First Nursing, the home of the patient safety specialist. It is my passion to bring you education, research and resources supporting patient (and nurse) safety. It’s been a busy week preparing for my first seminar for Vyne Education (for 6 CEU!). I will be facilitating in Indianapolis, Cincinnati and Columbus – a whirlwind tour of the Midwest (but I get to see my mom!) and I get to interview Lorie Brown, a nurse who is also an attorney. I am really looking forward to sharing info about her story and how she can support nurses who have to go before boards of nursing. I am counting the days until school starts again (18, in case you were wondering). My kids have been going to Ultimate Frisbee camp, and I have been plugging away looking for venues to get my message out there. My mission is to bring the best patient safety information to nurses around the globe, hoping to prevent future incidents of harm. My business coach suggested I look for speaking engagements; so we are working on that – if you know of anyone who would like me to talk about patient safety, please contact me! And a free bar of soap from Essential Journeys to anyone who meets with me in person to discuss how SFN can support patient safety for you or your organization! This week will be a short article– just updating you on Rose’s adventures with English school. As you may know, Rose is the Haitian student that SFN is sponsoring through nursing school in partnership with Consider Haiti. If you want to know more, you can read previous blogs about this incredible adventure. busses, trucks, pedestrians, scooters, motorcycles (motos), bicycles, donkeys, horses and anything else you can possible think of. These vehicles are loaded with a creative and unbelievable amount of people and goods. There are no streetlights or street signs, no guard rails, no sidewalks. Accidents are common and can be deadly. One day last fall when I was working at the clinic Esperance, 3 boys were brought in after being in a horrible motorcycle accident. I have included photos from both my trips to Haiti so you can see the eclectic mix of transportation. The fewer back and forth trips Rose has to make the better. She doesn’t know anyone in Saint Marc other than her fiancé and his family and she doesn’t feel comfortable staying with them. We are looking for a room for her to rent so she won’t have to go back and forth every day. Nursing school is from 2p-7p M-F. I asked Rose to share something interesting about Haitian culture. She shared with me that every January, families in Haiti cook pumpkin soup or soup joumou to celebrate Haitian Independence, which was won in January of 1804. Prior to that, Haiti had been colonized by France and they had forbidden Haitian slaves to eat any foods with pumpkin in them. To Haiti, pumpkin symbolizes freedom. There is a documentary about Haitian Pumpkin Soup called Liberty In A Soup by Dudley Alexis, a Haitian-born Miami filmmaker. My most recent email from Rose was August 6th, I asked her about nursing in Haiti, and about the amount of diabetes in Haiti, as well as medication management/polypharmacy. Remember that the translation is mainly google translate, with some help from Maggie (who founded Consider Haiti) – so I do my best to keep the flow of her words but make it understandable. That is Rose. How are you? How is your family? I thank you for your last letter. Thanks for the pictures too. You and your family are really nice. I am pleased to be able to practice English together, which will allow me to go faster in learning the language. To answer you about nursing in Haiti, I contacted a nurse and asked about it. He told me that nursing in Haiti is no different from other places. It is such a universal thing that there may be some minor deviations in how to teach this science or practice. The main role of the nurse is to execute the Dr.s orders, because the nurse has limits and must stay within this limit. Abel’s father has had diabetes for 7 years and it is really sad for him because he has suffered all his life. He takes 8-10 daily medications, which is not easy because many times this person can be discouraged and decides not to continue the treatment. Talking about diabetes reminds me of my father, who suffered much from it. Sincerely, I do not have much information about this disease especially on the type of diabetes. I know it makes the patient sick on some parts of the body that don’t ever heal. It often happens that the doctors have to cut off a limb of the infected person. I would like to know how many types of diabetes there are, I would also like to know if American doctors cut off the legs of people with diabetes. I hope my nursing studies will support my ability to relieve the suffering of people with diabetes and help in the fight against illness. Rose included some great pictures of her classroom and of her textbook – I am looking forward to getting my first note from her in English. October and nursing school will be here before we know it! 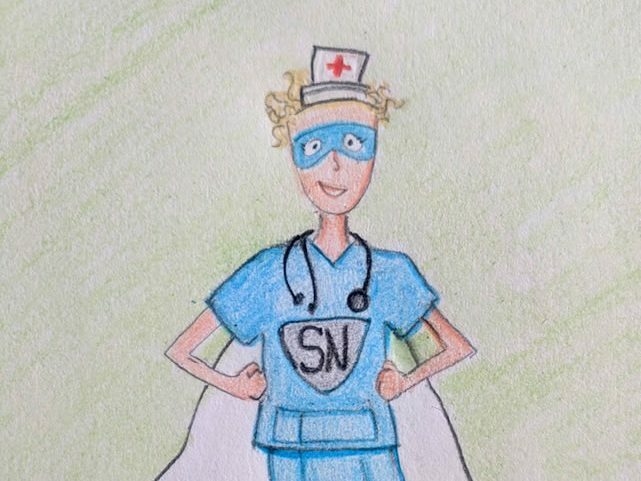 To get the latest updates on Rose, as well as info on new patient safety education, research and resources, sign up for the safety first nursing newsletter. Read through the course and fill out the evaluation form to earn continuing education credit. You also get access to a voice over powerpoint, references and resources.